The book will explore the impact of the Lawrence Report since it was published in 1999. Upon publication, Home Secretary Jack Straw promised that the Macpherson Inquiry would lead to real change in the policing of minority ethnic communities in Britain. Several senior police officers made similar pledges and insisted that the benchmark against which their commitment should be judged should be the extent to which progress was made 'on the ground'. In the aftermath of the report a host of initiatives have addressed issues ranging from police liaison with victims, first aid training, to stop and search procedures and police complaints. 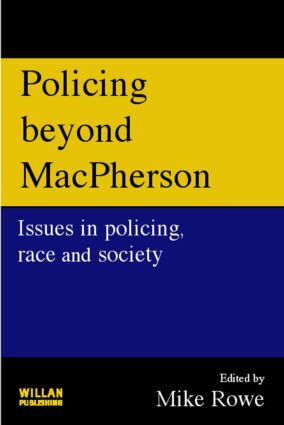 As well as exploring the many ways in which the Lawrence Report has impacted on the police service and on society more widely this collection assesses the extent to which, in retrospect, the Macpherson Inquiry has led to significant changes to policing, and highlights areas where future efforts ought to be concentrated. Police diversity training: a silver-bullet tarnished?